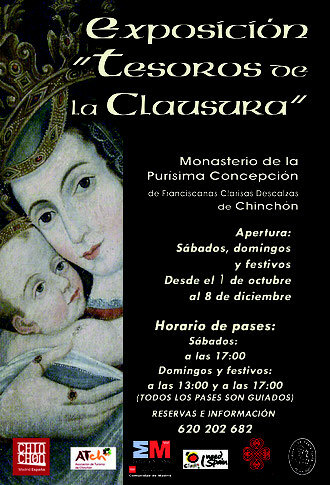 Parece que fue ayer cuando el Monasterio de Franciscanas Clarisas de Chinchón abrió sus puertas para permitirnos ver sus "TESOROS DE LA CLAUSURA", pero hace ya cinco años. ¡Cómo pasa el tiempo cuando uno se lo pasa bien! Ese es el secreto, sin duda. 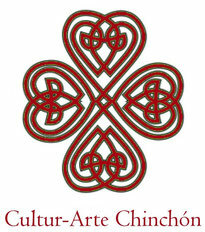 Lo pasamos genial dando a conocer la historia del Monasterio y de su comunidad. Hemos estudiado con tanto cariño cada pieza que no podemos ocultar el poso que nos ha dejado el tiempo que les hemos dedicado, y el público lo nota y nos lo agradece acudiendo año tras año... y ya van cinco. Gracias a todas las personas que nos han visitado hasta ahora y han podido compartir con nosotros la cotidiana sencillez de lo extraordinario. Y a las que están por venir, aquí les esperaremos con la misma ilusión que el primer día. La Exposición tiene programada su apertura al público desde el primer fin de semana de octubre hasta el 8 de diciembre. Así será durante todos los años que permanezca abierta. Hello to every single one, it's actually a good for me to pay a quick visit this website, it consists of helpful Information. I'm gone to tell my little brother, that he should also go to see this website on regular basis to take updated from most recent news. I blog often and I really thank you for your information. This article has really peaked my interest. I am going to take a note of your website and keep checking for new information about once per week. I opted in for your Feed as well. Have you ever thought about including a little bit more than just your articles? I mean, what you say is valuable and everything. However think of if you added some great photos or videos to give your posts more, "pop"! Your content is excellent but with images and videos, this website could undeniably be one of the most beneficial in its field. Great blog! We're a gaggle of volunteers and opening a new scheme in our community. Your website offered us with helpful info to work on. You have done an impressive job and our entire community can be thankful to you. Valuable info. Fortunate me I found your website by chance, and I am surprised why this twist of fate did not came about earlier! I bookmarked it. I really like what you guys are up too. Such clever work and reporting! Keep up the superb works guys I've included you guys to my own blogroll. I am genuinely grateful to the holder of this web page who has shared this enormous piece of writing at at this time.